Optimism surrounds the INDYCAR Series heading into their 2011 season with 17 venues playing host to the sanctioning body's best open wheel racing drivers. Personalities such as Dario Franchitti, will Power, Tony Kanaan, Danica Patrick and Helio Castroneves are a few notable drivers to be competing in the upcoming 2011 IZOD INDYCAR Series. For the first-time in almost two decades, anticipation of auto racing fans await the start of North America's top open wheel racing series as a collected, just sport. A pleasant scene presented into this year, the current series is a reformulation from what was a world that almost completely engulfed the continent's open wheel racing spectacle. 15 years ago today, the war for change in North American open wheel racing commenced on the little-known Walt Disney World Speedway as the first battlefield. A new organization called the Indy Racing League (IRL) formulated by Indianapolis Motor Speed president Tony George rose against the than-singular Indy-style race sanctioning body CART(Championship Auto Racing Teams). Proposing an all-oval schedule, the IRL mandate was to provide a more American-style form of open wheel auto racing where more drivers from the United States would flourish. On January 27th of 1996, the green flag dropped at the 1-mile oval. sent 20 CART-style race cars loose for 200 laps leading the inaugural event to occur outside of the previous CART regime. Leading the field to first green flag of the IRL, Buddy Lazier took the series' first pole as well as the initial 28 laps of the Indy 200 at Walt Disney World Speedway. While there were 6 lead changes through the first 75 laps, Indy Lights series graduate Buzz Calkins led comfortably for the final 125 laps. In a race where less than household names such as Lazier and Calkins were competing, the IRL would have a difficult name establishing notoriety against CART where names like Michael Andretti, Al Unser Jr and Paul Tracy prominently sparked open wheel racing fans. 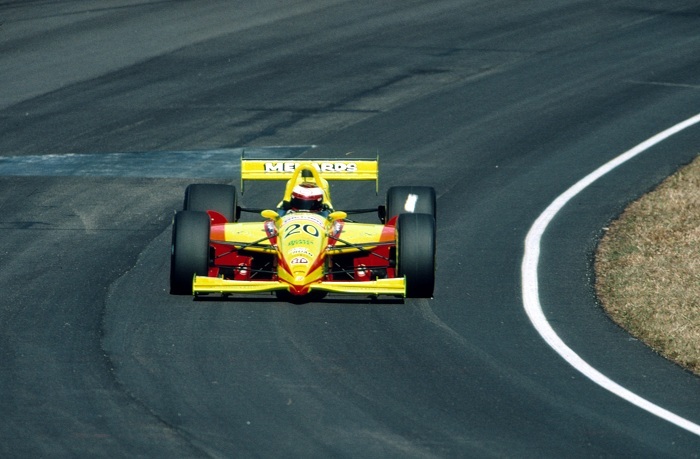 While some recognized names did populate the 1996 Indy 200 at Walt Disney World Speedway (Eddie Cheever, Lyn St James and Scott Sharp), the race largely consisted of lesser known drivers. At the early stages of the IRL, this was not a problem since it was complying with their series mandate of showcasing American racers. In fact, 16 of the 20 starters wore the United States Stars and Stripes flag. Notable members comprised in that first IRL field were many drivers who found success outside of the open wheel series. Future American Le Mans Series Corvette Racing driver Johnny O'Connell finished 5 laps down in 7th place. Finishing 4th in the Indy 200 at the Walt Disney World Speedway was the late Italian driver Michele Alboreto who went on to become an early pilot of the legendary Audi R8 prototype sports car. However, perhaps the most significantly future name to arise from that first IRL competition was Tony Stewart. Having just set the USAC tour on fire in 1995 by taking a triple-crown championship, the young Stewart was promoted to the ranks by team owner John Menard. 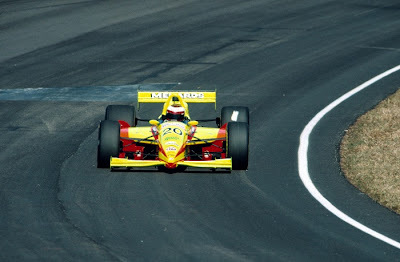 Tony Stewart and team finished 2nd in the Indy 200 in 1996. In 1997, Stewart became champion of the Indy Racing League just before he was lured to the more active, more fruitful fields of NASCAR. To date, Tony Stewart is a 2-time NASCAR Sprint Cup champion and 39-time race winner in the top stock car series. Following the first race of the IRL, battles ignited between the new series and the CART tour where allegiances changed. Though there was a brief time that two open wheel racing series appeared to have hopes of successful operation, drivers, sponsors and eventually engine manufacturers slowly sided with the more financially-secured IRL which held North American auto racing's biggest crown jewel (the Indianapolis 500). As drivers and support began to be lost in CART, the sanctioning body would fold after the 2002 season. A chance to reunite open wheel Indy-style car racing presented itself during the 2002-2003 off-season as the CART property went up for auction in liquidation. The IRL and Tony George made a bid to take over the CART series planning to defeat the organization they rebelled against almost 7 years before. However, a group consisting of three former CART team owners were granted victory forming the Champ Car series keeping the open wheel racing war alive between two. Though Champ Car struggled through much of its existence, the IRL(transitioning to the use of IndyCar Series in 2003 as the premier tour) did not greatly prosper despite their deeper pockets as well as more renowned drivers. Some observers and even auto racing legend Mario Andretti voiced concern about the series ever sustaining the all-oval schedule. While oval races tracks such as Texas Motor Speedway brought favorable crowds, less than half-full grandstands were a typical sight at IRL races. 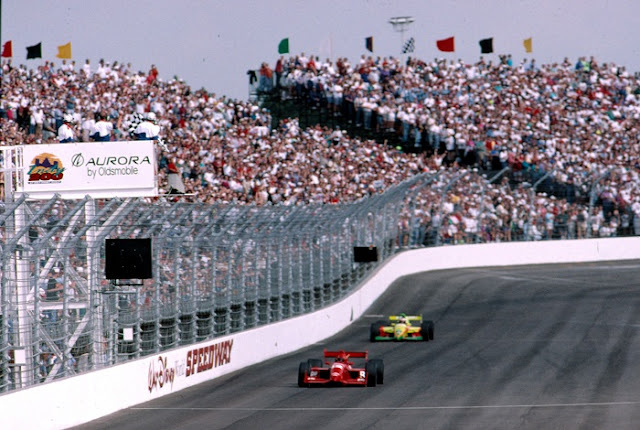 The IRL would hold true to the all-oval race format until 2005 when 3 races were added to their open wheel schedule desiring to make a final stand against the Champ Car series. Last season, the IZOD INDYCAR Series ran the first schedule where oval races were in the minority (consisting 8 of the 17 races). With American driver making up 80% of the IRL's first starting grid in 1996, that percentage dripped to 55% for the 2006 season opener at Homestead-Miami Speedway. For the 2010 IZOD INDYCAR Series, there were only 3 full-time drivers originating from the United States in a field of 24 competitors. While the number is expanding to at least 5 drivers in 2011 (Graham Rahal and Firestone Indy Lights front runner Charlie Kimball added through a new Chip Ganassi Racing team), some United States open wheel fans still suggest that there should be more native drivers for a series that competes all but 2 races inside North America. By 2008, the fight had taken the biggest toll on the Champ Car series as the reunification talks officially rejoined open wheel racing in North America under the IRL's IndyCar banner. It the end, as both side were worn to exhaustion, Champ Car and the IRL IndyCar Series realize their was a reason why the open wheel war could never result in a one-way victory. Each entity contained the pieces to a stable and successful auto racing series which could only be replaced when hands were shaken to end the open wheel conflict. Perhaps as a form of disarmament, the IRL name has been officially retired by CEO Randy Bernard early this year. Entering into the fourth season of reunification, the commitment of one series has now sparked substantiated optimism.